With a name that raises stirring images from the tales of the Arabian Nights you may be forgiven in expecting Acland Street’s famous cafe to be providing baklava and other Middle Eastern delicacies – but the origins of Melbourne’s iconic cafe is a story in itself and definitely worth re-telling. Loosely based on Arnold Zable’s novel by the same name Therese Radic has created, “not an adaptation but a play based on that epic piece of Australian literature” and draws upon the experiences and memories of the owners Avram Zeleznikow and Masha Frydman as they brought their business, culinary and life skills to a cafe in Melbourne that warmed its patrons with more than just food. Directed by Bagryana Popov the idea propelling the project is laudable, the histories of those who come to Melbourne (whether fifty years ago or five weeks ago) is an important one to share and learn from. Its just a pity that the play itself did not live up to its expectations. The acting in general was average but both Marta Kaczmarek playing Masha and Jim Daly as Avram offered heartfelt performances that were supported by the other regular patrons of the cafe: Richard Bligh, George Werther and Bruce Kerr, the latter providing perhaps the best performance of all. However, Jacob Allen as the young Martin, a reporter seeking to somehow transfer the stories of the cafe’s patrons on to paper, was almost rendered invisible. The one moment when his character has a chance to expand and offer some depth is when Masha asks for a story in return, “nourishment needs to go both ways” (I paraphrase) and yet he refuses, saying its best to “not get involved”. 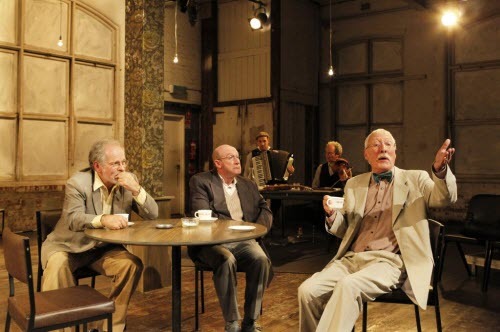 The play, while essentially a nostalgic meander down memory lane was at its best an eloquent elegy to the past – but unfortunately at the other end of the spectrum, lacked the dramatic appeal to be a sucessful performance. The lighting by Richard Vabre was excellent, the music by Ernie Gruner (violin) and Justin Marshall (accordion) under the direction of Elissa Goodrich was delightful and the space itself ideal (except for the stifling heat) – but the play, as a performance, sadly simply missed its mark.